Dr. Clark holds a Bachelor of Science in Professional Aeronautics as well as a Master of Aeronautical Science (Management and Safety specializations) from the Embry-Riddle Daytona Beach Campus. Dr. Clark also holds Doctor of Philosophy in Business Administration with a specialization in Aeronautical Science Management from Northcentral University in Prescott Valley, AZ. Organizations: Dr. Clark is a member of American Institute of Aeronautics and Astronautics, Professional Aviation Maintenance Association, Delta Mu Delta – Lambda Eta Chapter, as well as having been on the Board of Directors of the Georgia Airports Association in 2008-09 and the Secretary in 2009-10. In addition to these, Dr. Clark was the Valdosta Rotary Club Literacy Chair for Rotary International in 2010. Awards and Experience: Dr. Clark began her career in aviation by entering active military service in 1977 as an aircraft jet engine mechanic. She followed that career path through several USAF Reserve and Guard assignments. After leaving military service, she continued to work with the USAF as an aircraft and engine Air Force Engineering Technical Services (AFETS) specialist until 1997. In 1997 Dr. Clark left civil service to pursue her graduate degree. In 1998, she began work with CH2M HILL on DoD environmental and safety projects. 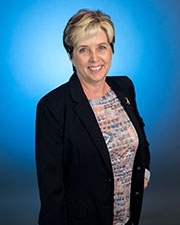 In 2004, she transitioned to the Center Director position for Embry-Riddle Worldwide's Moody Campus and commenced work on her doctoral degree. In 2006, she moved to the Director of Academics (DA) position at the Moody Campus. After completion of her doctorate, Dr. Clark was named the Executive Director and Airport Manager for the Valdosta Regional Airport in Valdosta, GA. She served in that capacity from 2008-2010. In 2010, she returned to work with CH2M HILL, managing DoD environmental, energy, and safety projects, then came back to the DA role at Moody in 2012. In 2013, Dr. Clark accepted a full-time faculty position within the College of Aeronautics. She has published several articles related to airport management and has served on a number of aviation-related committees or panels. Sustainability in the aviation industry and airport economic indicators are Dr. Clark's primary research interests. Dr. Clark is a certified Project Management Professional by the Project Management Instituted, a Certified Member of the American Association of Airport Executives, and a certified Airframe and Powerplant (A&P) Technician by the Federal Aviation Administration.